Providing you the best range of fluid bed dryer, double cone blender, tray dryer, vacuum tray dryer, rapid mixer granulator and vibro sifter with effective & timely delivery. Fluid Bed Dryer with latest improved design makes this unit a truly versatile for Pharmaceutical, Food, Dyestuff, agriculture Chemical industries. Our Fluid Bed Dryer is capable of drying materials in any forms like granular, powder or crystalline. 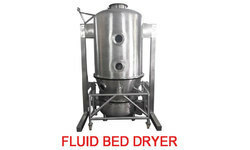 Fluid Bed Dryers (FBD) are used to dry materials by fluidization with hot air, and that will create turbulence in the wet product while flowing through it. Normally an initial moisture content upto 20% is ideal but materials with higher initial moisture content can be dried successfully. 2.5 kg to 500kg batch capacity. Available in GMP and Non-GMP Model (MOC: SS316 / SS304 / M.S). Pre air filtration by 20 micron filters and secondary by 5 micron filters, Final air filtration through HEPA (0.3 micron) filters (OPTIONAL). Intrinsically safe earthing system ensures complete elimination of static charge. On-line Sampling Port for easy sampling during operation. Pneumatically operated inflatable seals provided for filter bag and product container sealing with pressure switches FRL to ensure fail safe operation. Heating mode Electrical / Steam Thermic Fluid. Flameproof Motor with FLP Push Button and Flameproof Control Panel. Double Cone Blender is an efficient and versatile machine for mixing dry powder and granules homogeneously. All the contact parts made out of stainless steel of required grade by customer. 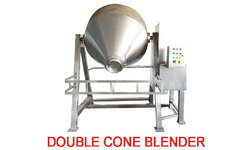 Two third of the volume of the Double Cone Blender is filled to ensure proper mixing. It can be used for Pharmaceutical, Food, Chemical and Cosmetic products etc. 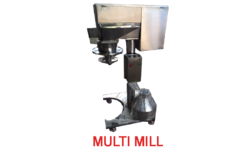 The conical shape at both ends of Double Cone Blender enables uniform mixing and easy discharge. Capacity from 25 ltrs to 5000 ltrs. We offer a precision engineered range of Tray Dryers specially designed for uniform circulation of hot air in the drying chamber. Tray Dryer is robust in construction built with Stainless Steel sheets and internally angles are used to reinforced the whole sheet body. 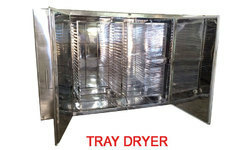 The external sheet of tray dryer will be of S.S. 304 and the internal chamber will be of S.S. 304 / S.S. 316. The internal structure is insulated with minimum 50 mm thick Glass Wool insulation and cladding with S.S. sheets. The dryer is having a fresh air inlet through 20 Micron filters and an adjustable air outlet flap. The door provided at front is explosion proof and is locked with the help of spring loaded ball latches and Neoprene rubber gasket to prevent leakages with suitable pressure. The maximum temperature attained inside the tray dryer will be 100 °C and will be indicated and controlled through DTIC. Trays are placed on the movable trolleys provided with castors. Available in different models with options for 12, 24, 48 and 96 trays. Easy accessibility of impeller for cleaning. Vacumm Tray Dryer is suitable for drying of thermal sensitive materials easily resolved, polymerized or deteriorated under higher temperature. Sterilization can be conducted prior to the drying process, during which no matter is allowed to enter the product. Static vacuum dryer eliminates the configuration damage of the drying materials, there fore widely used in pharmaceutical, chemicals and foodstuff etc,. CGMP Rapid Mixer Granulator are generally used in the pharmaceutical industry for wet granulation process, where dry powder will be charged into the mixing bowl and by adding the appropriate amount of binder, The machine performs mixing and granulation with the help of specially designed mixing bowl, dual speed main impeller, 3 blade chopper very precisely and effectively which leads to faster tableting speed with improved quality and least rejections. All contact parts made from ss316 / ss304 grade and entire machine designed to confirm cgmp standards. Models available from 3 L to 800 L working capacity. Contact parts are SS 316 / 316L. 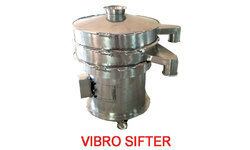 Size (Inch) 24" / 30" / 36" / 48"
CGMP Vibro Sifter is circular gyratory screens used for separating mass composition of solids from solids, liquid from solid and for gradation of materials as per particle sizes having very wide range of applications. It uses a principle of powder tumbling and interacting because of a specially designed vibrating motor with adjustable eccentric weight directly mounted on a top plate which is rested on spring pad to achieve continuous vibrations. A portable unit for easy operation and higher output. Double and triple deck unit with different screens can be provided. The dust-free arrangement, lead-free sieves, noiseless, maintenance-free unit. Less power consumption, variable flow pattern. Low operating and maintenance cost, long screen life. Easy to dismantle for cleaning screens. Capacity 12"/ 20"/ 30"/ 36"/ 48"
Multi Mill are mostly used for weting and drying granulation, pulverisations etc., in Pharmaceutical Industries, Chemical Industries, Cosmetic Industries, Ceramic Industries, Colour Industries Industries, Dyestuff Industries, Food product Industries etc. It also finds application in Pesticides, Fertilizers, Spices, Detergents, Insecticides, Plasitcs and Resins industries. All contact parts are made out of SS 316 quality material. Machine rated for continous operation. Various combinations of screens / speeds / number of blades / direction of rotation blade, can be selected. All contact parts can easily be dismantled and cleaned for change of product. . Wide range of SS perforated and wire knitted screen available. Flame Proof electrical motor can be incorporated. 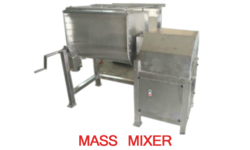 The Mass Mixer is an efficient and versatile blending machine for mixing of dry granules powders homogeneously. This Ribbon Blender gives best result for mixing of dry powder granules due to the design and shape of the mixing ribbon and product container. Effective mixing of dry or wet materials of Tablet Granualtion, Powder Mixing, Chemicals, Food, Confectioary etc. Conventional efficient mixing through paddle type blades welded to the main shaft horizontally mounted in the container has a single speed and simple rotation. East to clean and operate. Flame proof electrical can beprovided with extra cost. Capacity available in 50kg to 500kg. Starch Paste Kettle are generally used in the pharmaceutical industry for paste preparation. It has a universal application which gives uniform melting. Starch Paste Kettle is used in chemicals, Foods, Cosmetics and Pharmaceutical Industry. The basic principle of this kettle is the jacket for passing steam in order to melt down the product to make paste. This kettle has an unique tilting arrangement for discharging the product. 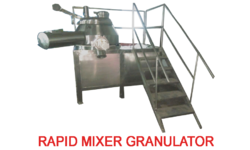 cGMP Octagonal Blender is an efficient and versatile blending machine for mixing and lubrication process of dry granules and powder homogeneously. Two third of the volume of the Cone Blender is filled to ensure proper mixing. The Octagonal Blender gives best result for granules due to very slow speed and octagon shape of container. It can be used for Pharmaceutical, Food, Chemical and Cosmetic products etc. All contact parts are made out of SS 316 or SS 316 L quality material. The octagonal shape & slow speed of rotating gives sufficient continuous movement to the granules, resulting in good quality. It is a slow speed blender and has a removable baffle mounted through a rectangular openable lid. Capacity available in 25 ltrs. To 10000 ltrs. Limit switch is provided for operator's safety. Looking for Tablet Line ?